He was the best president ever. While he was in power Haiti was better off. We were able to go about our business as we please, day or night. Yo pa vrèman kon-n nom mwen ki Patrick, entré mandé pou tout ansyen mou-n ki Habité nan Pierre Silly, bouk Champagne e mòn Lazar pou ti papa, pitit Gerard Princivil ya fout di nou ki mou-n mwen yé. Jah love. Give thanks and praises for sharing this great photograph. 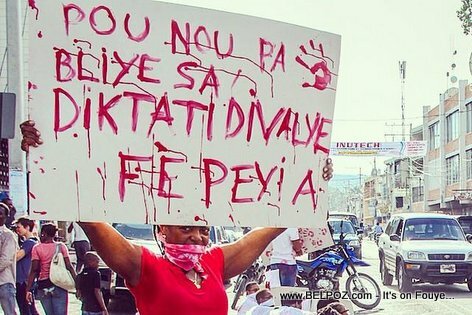 This protest sign and attire reflects perfectly how bloody the Duvalier Dikkktatorship was. I am so proud of this Haitian sister. Se pa Duvalie ki te krase l se Aisyen mechan yo ki pam jamm sivilize juskaske yo mouri.